D irector Aronofsky and co-writer Ari Handel have taken a bit of literary license in order to bring this legendary Biblical story to the big screen. Using Genesis chapters 6 through 9 as an outline, director and writer both incorporate concepts taken from the apocryphal "Book of Enoch" and other rabbinical texts as sources for their story. What they have created is psychedelic look at a pre-apocalyptic world that is both a metaphor and a delight to the all the senses. “Noah” provides all the elements that an epic story requires to keep the audience not only on the edge of their seats but also on their mental toes. 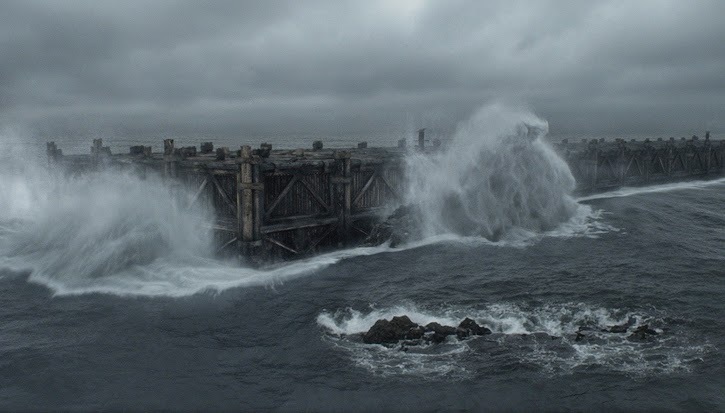 “Noah” is the hero’s journey that would make Cecil B. DeMille jealous in its sheer grandness of scale. The flood makes "2012" seem trivial, and the villain of the story is in the same league as Darth Vader, and Hannibal Lecter. Starring as the enigmatic Noah is Russell Crowe ("Gladiator," "Robin Hood"). Jennifer Connelly ("Requiem for a Dream," "A Beautiful Mind") stars as his loyal wife Naamah. The Bible mentions that Noah has three sons. Logan Lerman ("Percy Jackson & the Olympians: TheLightning Thief," "The Perks of Being a Wallflower") plays his troubled middle son, Ham. New comers Douglas Booth and Leo McHugh Carroll play sons Shem and Japheth. Emma Watson ("Harry Potter" franchise) plays Ila, Speaking of Hannibal Lecter, Anthony Hopkins plays the ancient Methuselah, and Ray Winstone ("King Arthur, "Beowulf") is Tubal-cain. “Noah” moves along in just under 2 hours and 20 minutes. 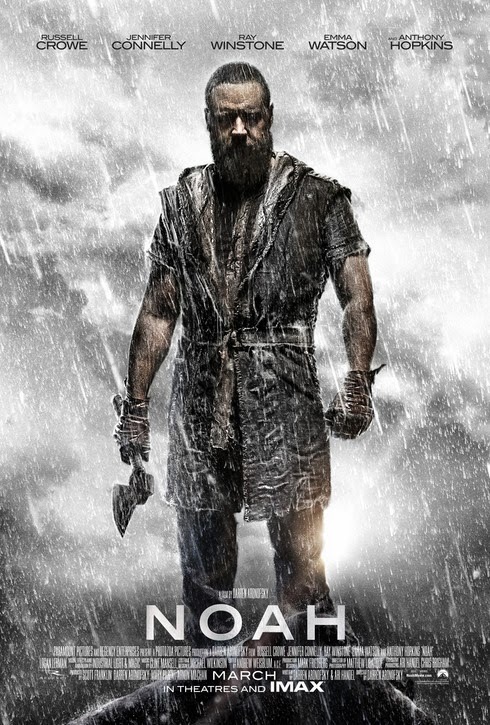 Although this film is about the wickedness and savagery of humankind, “Noah” only sports a PG-13 rating. The Bible gives only the barest of details of the reasons for why the Creator flooded the world as a way of rebooting his creation. Over the many millennia scholars, rabbis, priests, and Hollywood directors have given their take on the subject. This is just one more. In doing so, they moved much of the focus that scripture gives God; to Noah. As many like to say, "the Lord works in mysterious ways," and in this film it is through influencing the hearts and minds of his creations. In this film, no one ever refers to "God," "Our Father," or “Lord.” Rather, Noah and his Grandfather Methuselah refer to him as "The Creator." Aronofsky and Handel’s story is a human story. 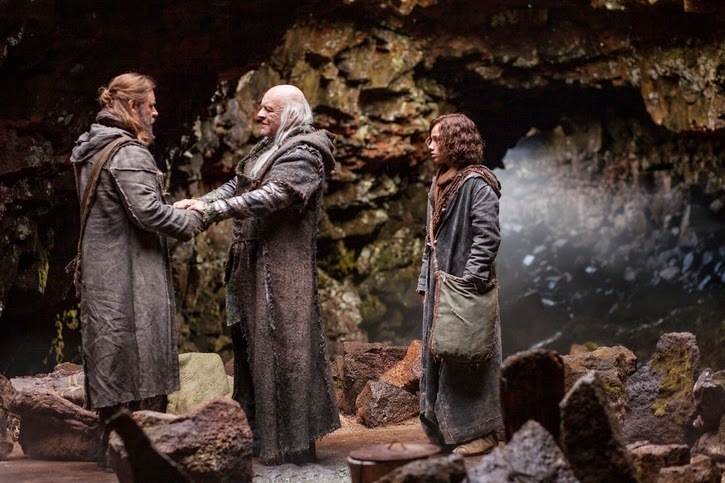 Noah is about a man (Crowe) who, through visions and dreams, is charged, he believes, to build a great ship and save the Creator’s non-human creations. He has a wife (Connelly), who is the mother of his children. She does what wives and mothers do, she supports her husband, pleads her children’s case, and she keeps the character of Noah human. In doing so, Naamah speaks for all mothers, throughout the ages, whose only wish is for her children's survival and happiness. The three boys, (Booth), (Lerman), and (McHugh Carroll), provide for some sibling rivalry. When the family finds a wounded girl during their travels (Watson), the rivalry between Ham and Shem turns to jealousy, and then to anger and then almost to hate. The major controversy of the film comes at a point after witnessing absolute wickedness, is that Noah believes that it is the Creator's intentions not only to start the world over as it was in the Garden of Eden, but this time without humankind. Thus the controversies begin. Noah’s world is at a time that is very alien to us. Aronofsky depicts it as it was described to Adam and Eve when they were evicted from the Garden of Eden in Genesis 3:17. In this antediluvian world, the landscape is familiar, but not quite. The animals that take refuge in the ark look like the creatures we see today, but not quite. Another element that “Noah” brings to the story are the “zohor” or “sohor” stones. Magic rocks that glowed brighter during the day and darker at night. Perhaps they are a remnant from ancient meteorites. A frequent Aronofsky collaborator, Matthew Libatique’s cinematography is not only remarkable and vivid, but emotionally tense. "Fire consumes all. Water cleanses. It separates the foul from the pure. What is pure rises. He plans to begin again." 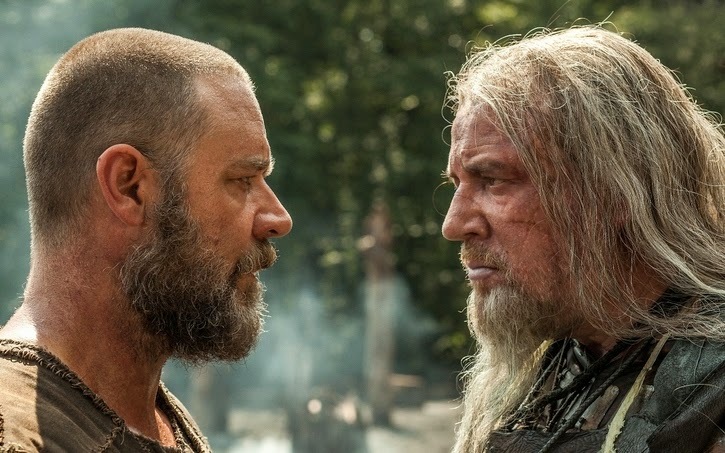 Russell Crowe’s Noah goes through an evolution of character. First, he witnesses his father’s murder. Then as a husband and father he is the sane and cautious steward of the land. As humankind intrudes into his world, Noah becomes more of a warrior, than the Creator’s servant. Finally, he goes through what all of those who have fought epic battles with men, nature, and with himself, he breaks down and we see a side that the Bible only hints at. Crowe is the personification of human spirituality in “Noah.” He recounts the story of creation with a dynamic that along with the visuals leaves one mind racing. It is a story, which, both creationist and atheist might find common ground. He is more than Maximus Decimus Meridius, more than Robin of Locksley, and more than Capt. Jack Aubrey; he is Noah, the man who through the grace of the Creator, saved the world. The Creator doesn't speak to Noah in a voice that the audience hears, so don’t be surprised. Instead through visions and dreams and a wee bit of psychedelic herbal tea provided by his grandfather Methuselah (Hopkins), Noah experiences what we would call in today’s lingo, a mind trip. In ways, Noah is like Michael Shannon’s character in “Take Shelter.” Aronofsky moves the focus of the anguish of man's wickedness and gives it to Noah. In doing so, "Noah" as a story, and as a character is both compelling, and relatable. Hopkins plays Methuselah in a Yoda-esque old man in exile, living in a cave in a mountain, alone. He has powers over the weak minded, can heal people, and has a fixation for berries. 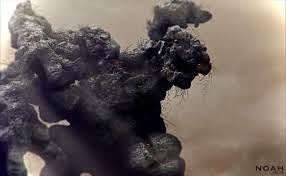 Form the “Book of Enoch” Handel brings in a repentant group of rock encrusted angels, exiled to Earth for helping in man. Forget that these may be the Nephilim mentioned in Genesis. Forget that these are fallen angels, who mated with human women, and produced the legendary giants of old. These Watchers once helped man, but then men turned against them. Now bitter, the Watchers have only one friend, the quirky but ancient Methuselah. Between, instructions in the art of being a shipwright, given to Noah in the form of LSD flashbacks, the help of the Watchers, and a magic seed of gopher wood given to Noah by his grandfather, Methuselah, the second act has Noah and the contrite Watchers busy building his ark. Ever wonder what kind of stinking, loud mess living in a floating zoo would be like? Well Naamah, Noah’s wife has the solution. Once again what the Bible leaves out, Aronofsky infuses rabbinical texts and apocrypha into his story. It is called literary license. What is in the Bible, is that Shem, Ham, and Japheth had wives when they entered the ark. In this story, they are still youths. Shem is the oldest, and is enamored with Ila, the girl they found years ago. Ila, played by Emma Watson, provides the love interest, yet plays the sympathetic sister to Ham, the middle child with issues. Logan Lerman does an excellent job playing the rebellious son. Like Cain, he is jealous of his brother. This provides for some true family tension. Aronofsky, and Handel, make sure those who tended to skip Sunday school, Catechism or Yeshiva, are brought up to date very quickly with little interpretation. Make no mistake; “Noah” is a complete and excellent story, superb acting, and extraordinary visual effects. Clint Mansell’s score doesn’t overpower the story, but draws out the emotions of the characters and the events. This is not a story about God's wrath and anger; it is a film about God's mercy. A film will some find blasphemous, while others will find enlightening. Others will enjoy it for what it is, a Hollywood film, created to tell an entertaining story.